The Lux Group to launch Vietnam’s first boutique cruise in the Gulf of Tonkin and on the Red River, Vietnam. Already operating in Vietnam’s Nha Trang Bay and Bai Tu Long Bay, under the five-star Emperor Cruises brand name, Heritage Cruises, a member of the Lux Group, will launch its first boutique cruise in the Cat Ba Archipelago in the Tonkin Gulf under the brand name of Heritage Cruises. The company announces the launching of its website and first cruise photos at www.heritagecruises.com and promoting through various travel trade shows and roads shows in Asia, Europe, North America and Latin America. Heritage Cruises introduces the first Vietnamese heritage and boutique cruise on the Red River and the Gulf of Tonkin. Launching in May 2019, Heritage Cruises will offer authentic experiences for 40 guests aboard an architecturally designed boutique river and ocean cruise ship in the Gulf of Tonkin. Amenities include a luxury spa, movie under stars, two restaurants, indoor and outdoor lounges, pool bar and swimming pool and 20 suites with picture windows offering river and ocean views. As defined by The National Trust for Historic Preservation, “Cultural heritage tourism is traveling to experience the places, artifacts, and activities that authentically represent the stories and people of the past and present. It includes cultural, historic, and natural resources.” Heritage Cruises derives the inspiration for its boutique concept and design from the heritage ships of the patriotic entrepreneur Bach Thai Buoi, who transformed transportation on the waterways of Tonkin in the north of Vietnam in the early 20th century. Being a heritage-inspired designer cruise ship, but still with a boutique concept, Heritage Cruises care about the guest experience, offering them an upscale lifestyle with an artistic twist, together with concierge services. “Like boutique hotels, boutique cruises are characterized by their intimate atmosphere and idiosyncratic style. They distinguish themselves from larger chain cruises by offering personalized attention and stylish, themed accommodation and a story to tell. We want to create memorable moments that focus on the local culture and arts encountered on the way.” said Pham Ha, CEO of Heritage Cruises. Beyond offering a cozier atmosphere, the small size of this ship creates a completely different experience, both onshore and on board. Smaller ships allow easy access to remote, less-visited places that the larger vessels just can’t get to, leading to refreshingly unique itineraries. This authentic experience offers the chance to cruise the Gulf of Tonkin (Lan Ha Bay, Bai Tu Long Bay, and Halong Bay) in an authentic and unique style, complemented by personalized service and on-request limousine transfers, which Heritage Cruises offers, taking the 5B highway from Hanoi to cut the journey down to just 1.5 hours. Heritage Cruises is available for FITs (free independent travelers), small groups and charters. This top-notch cruising experience is for repeat travelers to Vietnam wanting something different, exotic, and out of the ordinary. The exclusive cruising experiences are highly recommended for heritage travelers, seasoned leisure travelers, active holidaymakers, honeymooners, families, fine-art enthusiasts, nature lovers, photographers, groups of friends, VIPs and celebrities. Cat Ba is the largest of the 366 islands spanning the 260km2 seascape that comprises the Cat Ba Archipelago, which makes up the southeastern edge of Halong Bay in northern Vietnam. Cat Ba Island has a surface area of 285km2 and retains the dramatic and rugged features of Halong Bay. This island belongs to Haiphong City – an important industrial city which, together with Hanoi and Halong, forms an important economic triangle in north Vietnam. Approximately half of Cat Ba Island is covered by its national park, which is the home to the highly endangered Cat Ba Langur. The Cat Ba Archipelago boasts pristine beaches, secluded lagoons, coves, tropical forests, and lakes, allowing holidaymakers to swim, kayak and bike to fully experience the Gulf of Tonkin. The itinerary also includes the fishing villages of Lan Ha Bay, and watersports such as kayaking, squid fishing, snorkeling and wildlife spotting. On the three-deck Heritage Cruises ship, 20 suites range from 33m2 to 80m2, while food and beverage options include Le Tonkin and Indochine restaurants for Vietnamese gourmet cuisine. The ship also features an outdoor deck, complete with Vietnam’s first infinity swimming pool on a cruise ship, pool bar, and private cabanas, the Bach Thai Buoi Library for reading and relaxation, the White Lotus Spa offering massages and essential oil treatments, a dry sauna, fitness center, movies under the stars, and games room as well as its art gallery and auction center. Heritage Cruises offers a floating exhibition, L’Art de l’Annam, with the first designer art gallery of artist Pham Luc, known as the Picasso of Vietnam, along with the works of other famous Vietnamese artists. Guided art tours can be arranged as well as occasional auctions. Concierge services are a specialty on the vessel, with a one-to-one staff-to-guest ratio ensuring every need is attended to. On board are 40 crew members, including a cruise director and experiences manager. Apart from daily limousine transfers between Hanoi and Cat Ba Archipelago upon request, the Heritage Cruises team can also arrange for private charter airplanes, helicopters or seaplanes. “Our cruises operate from Got Harbor in Haiphong for the day cruise, with scheduled one- or two-night programs such as the Heritage Discover and Heritage Explorer. In addition, three- to four-night Heritage Expeditions to the former trading seaport of Van Don and private charters for leisure and professionals are available upon request,” said Pham Ha. Halong Bay is the result of geological activity from plate tectonics processes over millions of years. However, in the mind of the Vietnamese people, it contains rich folklore, myth and imagination. Halong Bay was born out of legends and it makes it even more mysterious. The birth of Ha Long Bay was associated with legend about dragons. God sent the Mother Dragon and her Children to help the Vietnamese fight foreign invaders. The dragons sprayed out pearls that turned into thousands of stone islands in the sea, creating a solid wall to block the attack of enemy ships. The location where the Mother Dragon landed was Halong Bay. The legend of the islands and caves is very much related to the history of the nation. The legend of Dau Go cave says that “In the war against Nguyen – Mong, Tran Hung Dao had put a lot of pointed wooden spikes in the Bach Dang River to guard against enemy ships. Because there were so many pieces of wood left, the fisherman called it “Đầu Gỗ”, meaning “Pieces of wood remaining”. Another legend tells that this is the place where Tran Hung Dao came to hide the pointed wooden spikes to prepare for the Bach Dang Battle , and the name “Dấu Gỗ” signifies “ a place to hide wood”. The Merveille de Monde book of France (World Wonders) was published in 1938 and it called Dau Go Cave, Grotte des merveilles (Cave of Wonders). Unlike Dau Go, the legend of the Virgin cave was a tragic love story. 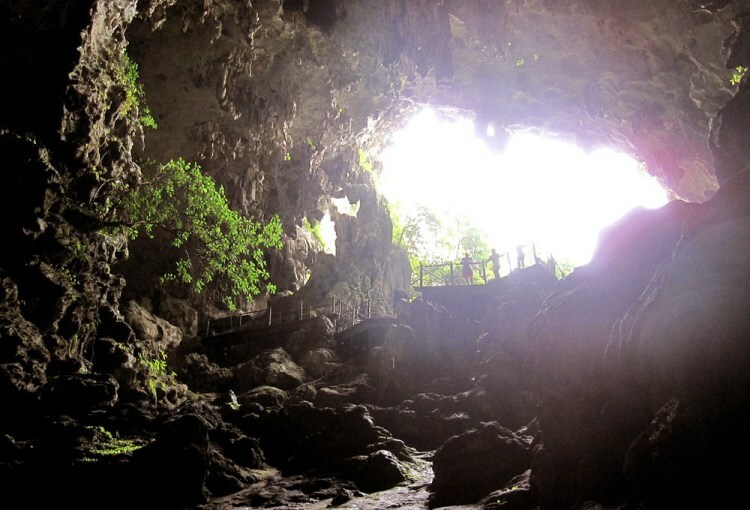 Virgin cave is located on Bo Hon Island along with Surprise Cave, Fairy Lake Cave and Luon Cave. 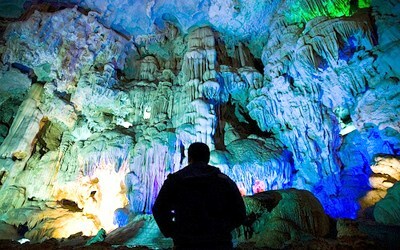 Hanh cave is 9 km from Cam Pha, 20 km from Bai Chay Tourist Wharf. 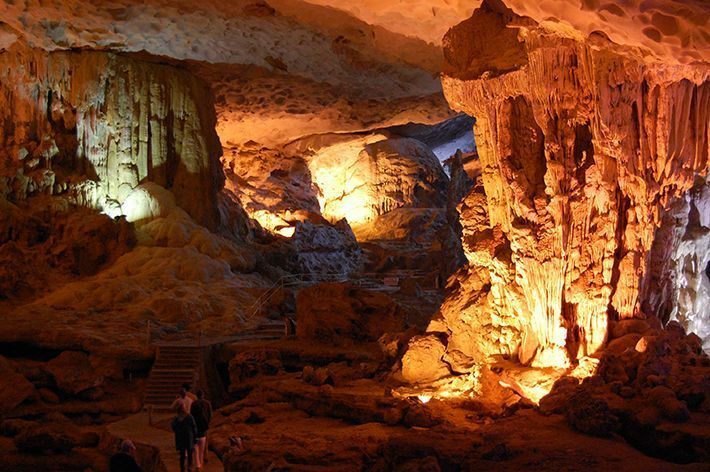 This is the longest cave in Halong Bay with a length of cave about 1,3 kilometer. Inside, there is a temple called Tam Co Temple (Three Girls Temple). It is said that there were three girls who came to this cave. Because the cave was so beautiful, they forgot the time and drowned as the tide rose and submerged them. They turned into gods of the sea, thus local people built this temple in order to comfort their souls. Cat Ba Archipelago consists of 367 islands, including Cat Ba Island in the south of Halong Bay, off Hai Phong City. It is known as the pearl of the Gulf of Tonkin and is the largest island of the total 1969 islands in Halong Bay. According to local legend, Cat Ba stems from the name Cac Ba (meaning Missus). For a time, there was an old woman who inhabited the island. She grew vegetables and supplied food to the men who fought invaders on a neighboring called Cat Ong (Mister).